St John's Hearing Aid Centre offer a wide range of private hearing aids from leading manufacturers, including Oticon, Starkey, Phonak, Unitron, Widex and more. Modern hearing aids use digital technology, providing small but powerful computers for your ears. Their capabilities are remarkable; helping you to distinguish speech in noisy environments, filling the gaps caused by high frequency hearing loss, and preventing feedback and whistling often associated with older styles of hearing aids. With a wide variety of sizes and designs to choose from, our qualified audiologists will help to advise you on the most suitable digital hearing aid for your specific requirements. Note, many of these features aren't available via the NHS (see NHS vs Private Hearing Aids), but can make a dramatic improvement to the quality of your hearing. These discreet hearing aids are placed directly in the ear, with only a small portion visible in the outer ear. The newest custom fit style is virtually invisible when worn. Sitting in the second bend of the ear, it is subject to the suitability of the receiving ear canal and the client's Hearing Loss. These devices fit completely in the ear canal. Only the head of a tiny clear plastic extraction cord (with which you insert or remove the instrument) shows outside of the canal. ITC instruments involve a custom earmould that fits down the ear canal and a small portion that faces out into the outer ear. These easy to fit and wear hearing aids are placed behind the ear, with a tube that directs sound into a receiver in the ear. The RIC device is small, discreet and quick to fit. Perfect for many first-time wearers. It sits behind the ear with fine tubing to the receiver in the ear. The mini BTE also sits behind the ear. Containing the technology, while a clear tube then directs amplified sound into the ear canal to a custom earmould / earbud. BTE instruments' technology is housed in a casing that rests behind the ear. A clear plastic tube then directs amplified sound into an earmould inside the ear canal. These hearing aids are made in the arms of spectacles (glasses) and are designed for people with predominantly conductive Hearing Loss. Sound is transmitted through bone behind the ear directly to the cochlea. Modern Rechargeable Hearing Aids offer a number of benefits including quick wireless charging with long battery life, clever combined case and charger units, auto-on feature, wireless streaming, automatic sound adjustment and more. The price of a hearing aid varies depending on the specific model, the features you need for your particular hearing loss and how effective it is in the various noise environments you require. 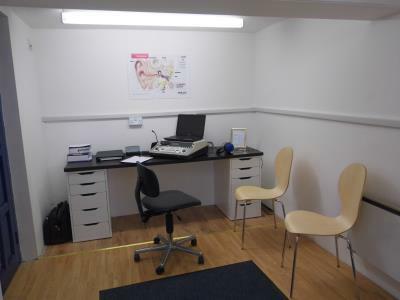 Our prices also include the cost of the professional services of the audiologist, fitting and adjustments. Inserting and removing your hearing aid. Should you have further questions once your hearing aid is in use, we offer a comprehensive aftercare service. Just call one of our branches and we'll be glad to help. We offer free hearing tests at our branches or in the comfort of your own home. If you don't know whether you need a hearing aid or what type would be best suited to your needs, we offer Free Hearing Tests, which can be booked at either of our branches in Grange-over-Sands or Edinburgh or done by appointment in the comfort of your own home as part of our Free Home Consultations service. If you're unsure about whether private hearing aids are right for you, our NHS vs Private Hearing Aids article explains some of the differences between the NHS and going private.